You might well have witnessed an impromptu or off-the-cuff speech. Or, rather, you thought that it was an impromptu speech. Because the fact is that when you have to give an impromptu speech, then you have already done a lot of preparation and planning. Plus, you have rehearsed and edited your material ready for the event. So that’s the magic of a good impromptu speech. You make it look effortless. So you give the appearance that you haven’t really worked hard. But, in reality you really have done just that. So, this short video aims to help you out with some best practice tips for how to give an impromptu speech, whether it’s at work or the office party speech. So, stick To The Basics. Build an understanding with your audience. And, of course, take your time and use a moderate pace. Of course your audience will receive your impromptu speech with all the enthusiasm that it deserves. So, you can expect some good reaction to your words. Because that’s the reaction you want since you learned how to give an impromptu speech. 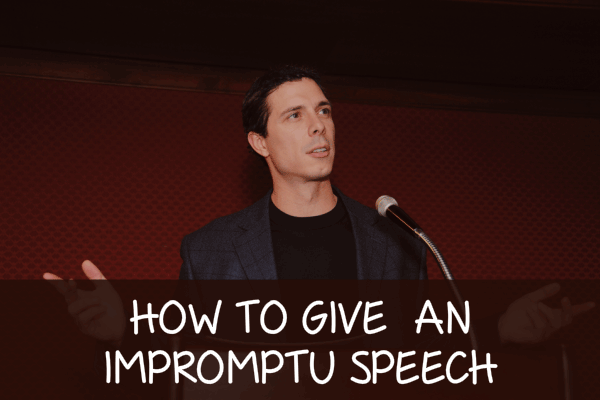 And, now that you know how to give an impromptu speech, you can do the same trick again at a different event. So simple when you know how.